A place for the things I geek and the games I play. Hey there! Thanks for dropping by Akodoken! Take a look around and grab the RSS feed to stay updated. See you around! On December 21, 2011 at 8:55 a.m. EST Brandon Sanderson announced to the world, “Ladies and gentlemen, A Memory of Light–the final book in The Wheel of Time–has been finished.” While there are still several revisions to be handled as well as printing, marketing and general hoopla before the book officially sees publication but this was still an important moment for fans of The Wheel of Time series. For many readers the announcement represents the culmination of a journey which began twenty two years ago in 1990 when The Eye of the World first hit the shelves. In fact, it is a moment many readers were worried would never be seen as James Oliver Rigney, Jr. (also known by his pen name, Robert Jordan among others) announced in 2006 he had been afflicted by cardiac amyloidosis, a condition which took his life in September of 2007. He continued writing until he passed away and prepared notes as well as insights with his family so the book could be completed. Later Brandon Sanderson was chosen as the writer to complete Jordan’s work. Personally I have been a fan since I was first introduced to the series in 1995. However, as the series stretched beyond the six books which were originally planned (A Memory of Light will be the fourteenth book in the series) it became harder and harder to continue reading the books. Or perhaps it would be more accurate to say it became harder to finish each book knowing there was still so far to go before we would see the end of the story. A decision was made. Although I purchased each book as it was released I did not read them. I placed them on the shelf and forgot about them. I decided I was not going to read the series until it was complete. With Sanderson’s announcement concerning the final book and a tentative release date some time in 2012 I decided it was time to start reading The Wheel of Time once again. However, after much consideration I decided that I could not begin reading the series by cracking open The Eye of the World. In 1999, Jordan published a novella titled New Spring in a collected anthology of modern fantasy called Legends. The novella was later expanded into New Spring: The Novel, which was the story of al’Lan Mandragoran, the last royal heir of Malkier, Moiraine Damodred, niece of King Laman Damodred of Cairhien, and Siuan Sanche, the daughter of a fisherman from Tear. The story is a prequel to the events which take place in The Eye of the World so instead of reading the books in chronologically order of publication I decided I needed to read them in the chronological order in which the story unfolds. 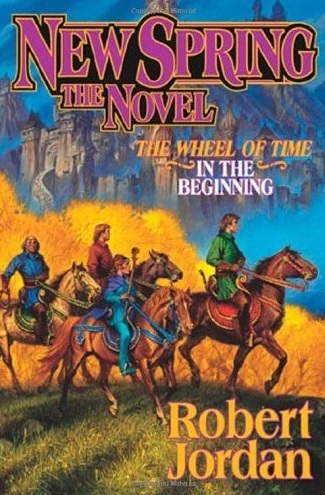 New Spring: The Novel is an interesting book because it gives us a new perspective on three of the most important characters in The Wheel of Time. Each of these characters are individuals who have been chosen by destiny to play an important role as the wheel turns even if doing so is perhaps the one thing they want less than anything else. Lan is heir to the lost kingdom of Malkier, a symbol of all that has been lost to the Dark Ones, and supporters rally to him in hopes that one day he will lead them to reforge his lost homeland. Moiraine is a viable candidate to claim the throne of Cairhien and the Aes Sedai have a strong desire to place one of their own upon the that very throne. Siuan comes from lowly beginnings but her strength with the One Power and her unique abilities to sort out complicated puzzles and take command of those around her doom her to rise high within the ranks of the Aes Sedai. New Spring chronicles the beginning of their journey towards the Dragon Reborn and details how influential the forces are which stand against them. For anyone who has decided to finally indulge in this epic of fantasy literature this book is the perfect place to start. I read New Spring several years ago. In fact, I’ve read all the books so far and intend to read “A Memory of Light” when it comes out. I can’t imagine reading all the books in succession, though. That’s probably close to 10,000 pages or so. I loved the series, but it is just too much of a behemoth for me tackle like that. I’ve read it through once, and though I’m sure I’ve forgotten important details, I will probably never read it through ever again.